Commentary: equities on average added another 2% positive returns to their monthly performance. Markets had nary a pullback during the week. While positive price action is nice to see for investors, the fact that there is not a ‘backing and filling’ process in the price action is troubling. The backing and filling process is an indication of good two-way flow in which new buyers are replacing sellers exiting the market. Additionally, that price action serves as a foundation for the market. A market in which prices move higher in a virtual straight line has not developed the support base. The chart below highlights the price action for the last two months. 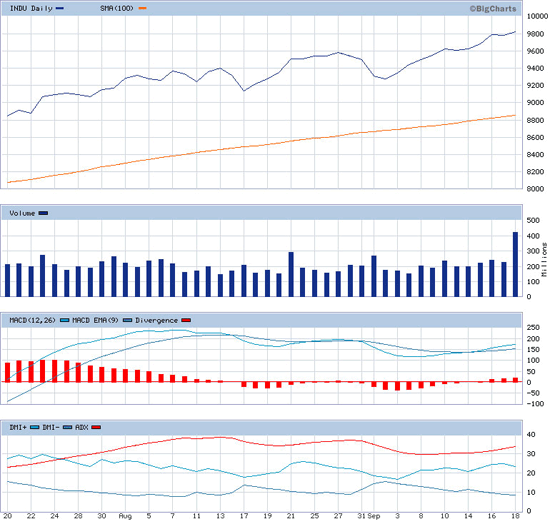 One can see that the September price action has been a straight line, adding 500 points to the DJIA. Markets typically do not track in that fashion. That said, the market is the market. Commentary: government bonds gave a little bit of ground this week, but still maintain an overall firm tone. We do have large monthly auctions (2yr, 5yr, 7yr) next week so Wall Street would like to back the market off in an attempt to buy the auctions a little cheaper. The price action in the U.S. Treasury market still strikes me that there is a growing camp that believes we will experience asset deflation. That phenomena would support bonds, but I do not see how it could possibly support equities. This debate is not receiving as much attention as 6 months ago . . . but it should! The riskier parts of the bond market generally treaded water this week. That fact is a positive, in light of the positive trends in equities. Typically, if equities are trending higher, then bonds would head lower due to concerns of higher inflation. The fact that bonds in general are firm plays into the point I highlighted above. The conundrum between the equity markets and bond markets continues. Commentary: the dollar strengthened by approximately 1% vs the Japanese yen this week, but overall continued its decline vs the Euro and other major currencies. The greenback closed lower by approximately .5% on the week and is now down 2.2% for the month. The silence from Washington on the dollar weakness remains deafening. The Fed’s charge is ‘price stability’ and to ‘grow the economy.’ The Fed has clearly failed to achieve its goals and is now faced with pursuing a weak dollar policy to promote inflation. This seeming necessity is a very dangerous game. Why? Other countries may similarly look to devalue their currency in order to support their exports. I am hearing this concern coming from Japan and we see that as the Yen weakened vs. the greenback this week. If we do get some dollar strength, look for a selloff in our equity markets as clearly a large number of funds have entered into the dollar carry trade in which they have sold dollars and used the proceeds to buy global equities. I feel compelled to repeat my statement from last week. This ‘positive carry’ trade is nothing more than implementing leverage. Do not confuse leverage with brains when a market is rising because as I said the other day, leverage is death when that bull becomes a bear. As I think of market developments, I am convinced that this ultimate unwind of leverage trades currently being implemented is Jeff Gundlach’s reasoning for being bullish on the dollar. How will this work? Investors will look to exit their risk based investments (emerging market stocks and the like) and buy back the dollars which they have borrowed. In the process, the dollar may rally significantly. The timing of this unwind is the critical question. Commentary: gold largely marched in place this week. There was an announcement that the IMF may look to sell upwards of $13 billion of its gold reserves. The fact that the gold market took that news without selling off is fairly impressive. It is likely an indication that global central banks would like the gold as they look to diversify away from the U.S. dollar. Commodities overall did have a decent week and the Commodity Index is now up approximately 1.5% on the month. Given the strength in equities, commodities have actually been a recent laggard. The Baltic Dry Index continues to run in place. I view that as reason for concern. How can global equities in general and commodities specifically continue to increase in value if the major indicator of global trade, that being the BDI (Baltic Dry Index), is not trending higher? Economic data seem to indicate hints of strength, but the data comes with major qualifications. For example, the perceived strength in retail sales was largely driven by the ‘pull demand forward’ benefit of the Cash for Clunkers program. Housing starts were positive, but it was focused on multi-family units while the much larger component within this data — that being single family units — actually declined. Unemployment claims declined, but unemployment actually increased in 27 states.